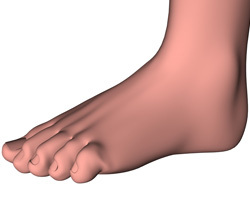 A hammer toe is a toe that is deformed, with the end of the toe bending downwards. It usually affects the second, third or fourth toe, and appears to look like a claw. A corn may form on the top of the toe, and a callus may form underneath it. It may be caused by a muscle imbalance or by poorly fitting shoes, when toes are unable to be fully extended. A flexible hammer toe can be manually straightened out while a rigid hammer toe cannot be pulled straight. A physical exam will confirm the presence of a hammer toe. An X-ray can show more about the patient’s specific condition. Treating a hammer toe before it becomes “fixed” in position is essential. Orthotics, splints, or wearing shoes with roomy toe-boxes may help non-severe cases of hammer toe. In severe cases, surgery may be performed. Pain and walking difficulty may increase, and a permanent deformity may occur. Repeated friction to the tip or the top of the toe can lead to wounds and infection.